Adams was a member of the Continental Congress, Signer of the Articles of Confederation, and Chief Justice of the Connecticut Supreme Court. 1910, Canada. 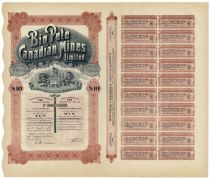 Stock certificate for 10 shares. Rust/Gray. Vignette in center of shield flanked by a lion and horse. Coupons at right. Uncancelled and fine.